Whether it’s breakfast, brunch, or a cozy night in, these gingerbread pancakes are just the item to make any cold weather occasion a real treat. The inviting scent of gingerbread wafts through the house creating spicy goodness; an irresistible indulgence. 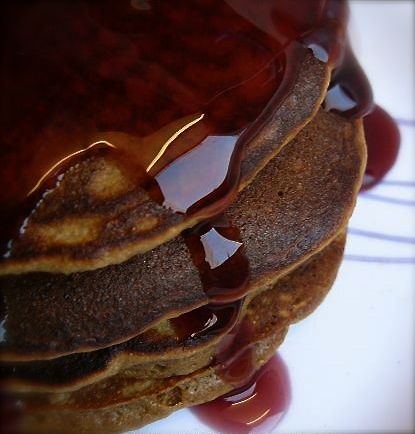 Serve them with real Maple Syrup or try them with my hot Maple Apple Sauce, Maple Walnut Sauce or Maple Cranberry Sauce. They are great with just a dusting of powdered sugar even! If you like pancakes and you like gingerbread cookies, you will love Ginger Bread Pancakes! 1 cup rice milk, or rice milk, almond milk.. In a bowl, mix together the flour, cocoa, ginger, cinnamon, baking powder, baking soda, salt, and cloves. Set aside. In another bowl, whisk together eggs, sugar, oil, milk, and molasses. Pour into the dry ingredients, and mix with a spatula until just combined. Do not over mix. Grease a griddle with butter and place over medium heat until hot. Ladle on a 1/4 cup of batter for each pancake. Cook until bubbles form on the surface of the pancake, turn and cook until the other side is lightly browned. Serve hot, dusted with powdered sugar, or with a drizzle of home made syrup. For a decadent brunch serve with whipped cream and sliced bananas. Place apples, honey, and water in a saucepan and bring to boil over medium heat. Reduce heat, cover, and simmer for 10 minutes or until the fruit is soft. Add lemon juice and mash. Pour w over pancakes and serve. Place ingredients in saucepan and bring to a boil over medium heat. Reduce heat to a simmer and cook for 5 more minutes. Allow to cool a bit before pouring over pancakes. This entry was posted in Uncategorized and tagged Cake, maple syrup. Bookmark the permalink.